Yes, this is my second blog post today. It’s the first Favorites Friday and I was admiring my cluttered mantle so I thought I’d share some of my favorite things from it with you guys. Feel free to join the fun and add your posts and photos to the link up party at http://new.inlinkz.com/luwpview.php?id=481499. Here’s the mantle today. Notice the socks? Haha they’re one of my favorite things. They make me laugh and were my husband’s idea. I threw out the ratty stockings we had before the move to this house and haven’t yet made new ones. I was stressing about it (out loud) when hubby disappeared into the bedroom and came back with these socks. Good enough! The wooden flowers are from our second wedding anniversary when I was surprised with a trip to the beach for a weekend. I guess I’m feeling grateful for my husband and the memories we’ve made tonight. The stone kitty is also a treasured keepsake. I got her at Chichen Itza on a tour of its pyramids in Mexico during our honeymoon. It started raining in the middle of things but was so warm that we just let ourselves get soaked while everyone else was buying ponchos. What’s a little rain when you’re warm and in love? That’s all for now folks! Here’s the link again to the party: http://new.inlinkz.com/luwpview.php?id=481499 come share your favorites and read about others’. This entry was posted in Artist's Studio, Collaborations, Favorites Friday, Our House and tagged Christmas 2014, Christmas decorations, favorites friday, holiday mantle, honeymoon, honeymoon keepsake, husband, link party, link-up, linky party, lovey memories, romantic getaway, Silly husband, sock stockings, stone kitty, wooden flowers on January 2, 2015 by quiltartbymegan. 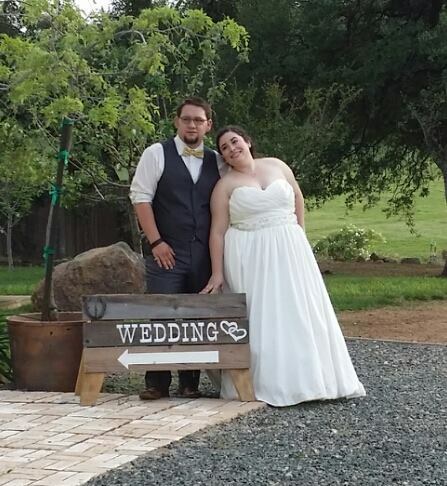 My cousin Zack got married this weekend to his high school sweetheart. Doesn’t he look dapper?! Of course the bride is gorgeous. Welcome to our family, Kacee. I love you both. I wasn’t able to attend the wedding, but wanted to make something special for the couple. So here’s what I came up with. It’s a joint present with my Dad. He paid for the materials. It’s a crumb pillow! 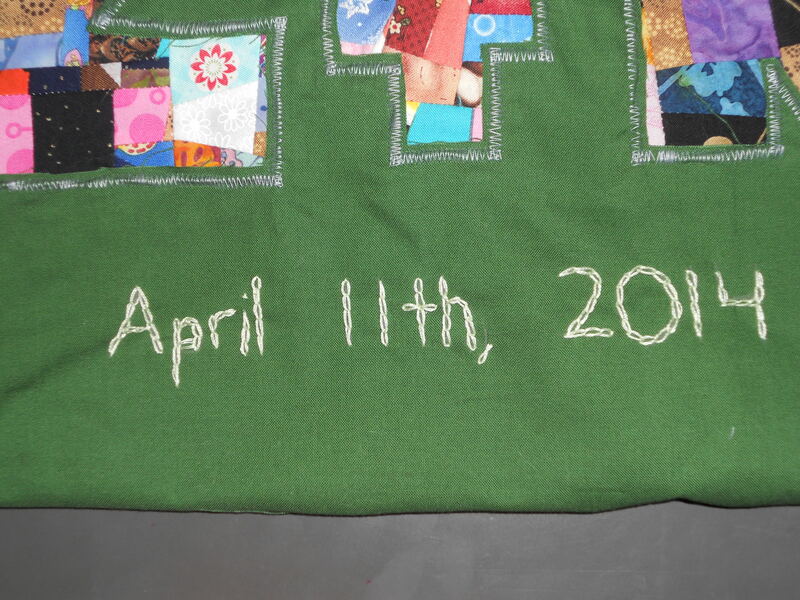 This one measures 12×20 and has a few embroidered details as well as their initials. 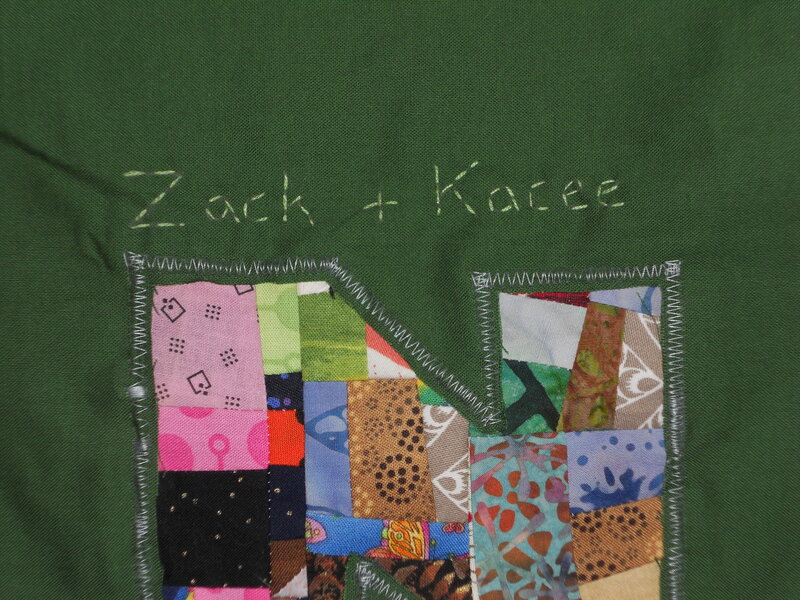 On the bottom is their wedding date, and before the “Z” you’ll find their first names. See? Congratulations Zack and Kacee. Happy honeymoon! 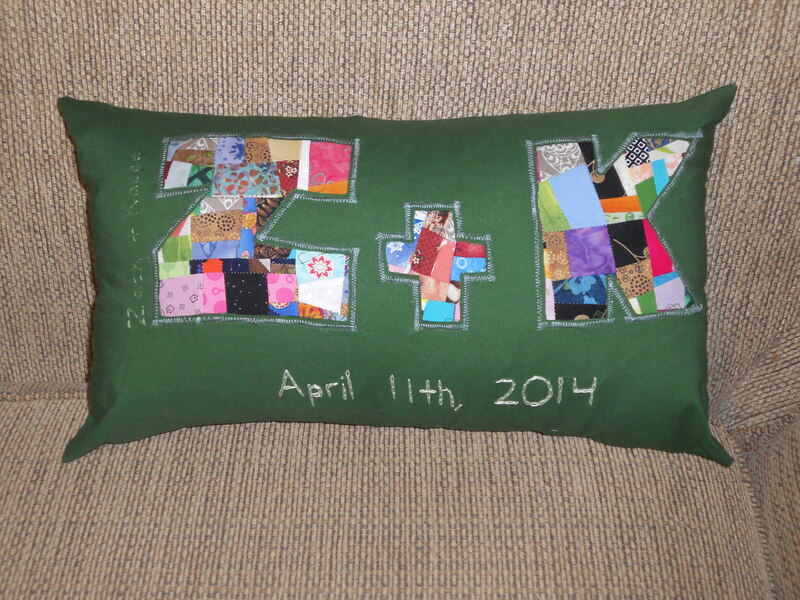 This entry was posted in Collaborations, Crumb Quilting, Custom Work, Embroidery and tagged bride, commission, crumb pillow, crumbs, embroidery, engaged, groom, honeymoon, initials pillow, Kacee, QUILTArtbymegan, wedding, wedding gift, welcome, Zack on April 14, 2014 by quiltartbymegan.